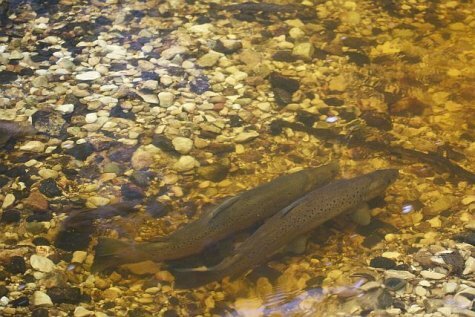 We took a look at how the sea trout have accepted the artificial spawning sites. The work has turned out to be gratifyingly useful. 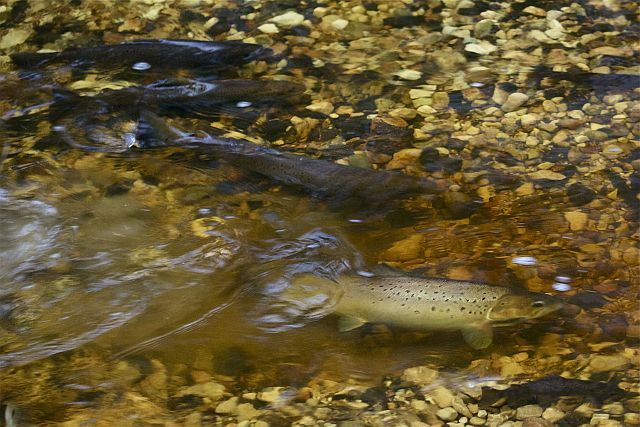 Sea trout started to head upstream in rivers in August-September when there was enough water in the estuaries; westerly winds that raised the sea water level considerably contributed to that. There are many competitors for the washed-out roe – the spawning is surveilled by river trout, young sea trout – about a year and a half old - that live in the river, and for instance burbots if they live in the same river. Scientists have not noticed direct looting of the nest troughs – the species has to be preserved after all. In the spawning sites spawning pairs can be seen; they are surveilled by two-three so called dwarf males and sea trout or river trout, generally more than four individuals. With the low water level this year it is easy to watch what goes on. A number of interested parties move on the river banks, not all of them with the best of intentions. We were checked three times in the course of a few hours – our thanks to the conscientious Environmental Inspectorate and RMK (State Forest Management) inspectors. One final request: if you notice any suspicious doings at river banks please call the Environmental Inspectorate’s round the clock emergency hotline, 1313.